Home / Unlabelled / 2019:The Battle To Control Rivers State APC, Oshiomole Vs Amaechi"
2019:The Battle To Control Rivers State APC, Oshiomole Vs Amaechi"
National Chairman of the All Progressives Congress, APC, Comrade Adams Oshiomhole, aka Oshio Baba, and Minister of Transportation, Rt. Hon Chibuike Amaechi, are entangled in a strategic struggle over who commands the party in the South-South geo-political zone and Rivers state in particular. Both party titans made their marks as former governors of Edo and Rivers States respectively, but Amaechi, who is also the Director General of the President Muhammadu Buhari Campaign Organization, was practically in charge of the affairs in states of the zone until Oshiomhole emerged as national chairman. The strapping exception of Amaechi’s power is Edo, the only state the party governs at the moment in the region and which Oshiomhole, as the immediate past governor, installed one of his loyalists, Mr. Godwin Obaseki as his successor. However, since Oshiomhole took over from the former national chairman, Chief John Odigie-Oyegun, who, during his tenure, did not struggle for supremacy with Amaechi, there has been a seeming leadership tussle between him and Amaechi. the minister has never concealed his predilection for the Director General of the Nigerian Maritime Administration and Safety Agency, NIMASA, Mr. Peterside Dakuku, the party’s gubernatorial candidate in the 2015 general election in opposition to Senator Magnus Abe, representing Rivers South-East senatorial district. But Oshiomhole appears not favourably disposed to Amaechi’s pick. Amaechi would have run him out of town in the horse-trading for the party’s 2019 governorship ticket. “I am amused by some of these allegations and stories making the rounds. For the records, the disagreement between me and the minister (Amaechi) is political. “That means the entire country knows that he cannot pretend to be neutral or an unbiased umpire in any matter in which my interest and the interests of those interested in me are concerned. Yet, as the leader it is his responsibility to provide a level playing field for us all,” he asserted. 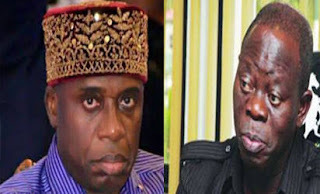 Amaechi is still the principal of the party in the state just like Oshiomhole also holds sway in Edo state, but whether the national chairman will allow the director-general of the Buhari Campaign Organization to produce the governorship candidate of the party at “The Treasure Base of The Nation” yet again is imprecise.